Kerinci Seblat National Park is the largest National Park in Sumatra Indonesia covering 1.5 million hectares. Parts of the park are in West Sumatra and South Sumatra. 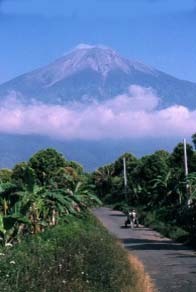 It is home to the highest mountain in Sumatra, Mount Kerinci, 3805m an active volcano. Mount Kercini has been closed to visitors since 2004 because of high volcanic activity. Kerinci last erupted on 6th August 2004. On Sept 2007, a number of minor seismic events occurred. On 9 Sept 2007, vapor emissions increased, pulsing at 5 minute intervals, and accompanied by inky black ash. The plume rose – 700 -800 m above the crater rim and ash fell within 8km of the volcano. The Center of Volcanology and Gelological Hazard Mitigation reported that the Alert Status was raided to 2 (on a scale 1 – 4). Visitors and tourists were not permitted to approach the crater closer than 1km though many people are still climbing despite these warnings. You can either reach the National Park from Jambi or Padang (which is closer). The National Park is mostly inaccessible due to the dense rainforest this park offers protection to some of the most endangered species of wildlife including the Sumatran Tiger, Sumatran Rhinoceros, Sun Bear, elephants, Clouded leopard, Tapir and over 370 species of birds. The Rafflesia arnoldi, largest flower in the world, can also be found within the park. The main access point to the park is Sungaipenuh in the province of Jambi. There is a National Parks office located in Sungaipenug where you will need to get a permit to access the park. Sungaipenuh is 246km from Padang around a 6 hour bus trip. 20km south of Sungaipenuh is the small lake Danau Kerinci at the base of Gunung Raja (King Mountain). The highest lake in South East Asia, Danau Gunung Tujuh, at 1950m above sea level is located close to the village of Pelompek, 8km from Kersik Tua. It's about a 3.5 hour trek up to the lake. The lake is within the Kerinci Seblat National Park so you will need to get a permit in Sungaipenuh before going. On the outskirts of Kerinci Seblat National Park in the Sangir Baranghari district are the Bukit Sungai Mintan caves. Best way to get there is to travel from Padang to south Solok and then on to Sangir Baranghari. These caves are not visited by many people so are still in pristine condition with many stalagmites, stalactites as well as a few fast flowing underground rivers.